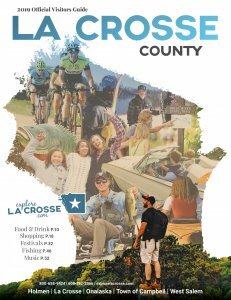 La Crosse County is at the epicenter of a growing sport that was started by the lumberjacks who were hired in the late 1800’s to prevent log jams on rivers as America’s cities grew. Timber in remote areas was being transported down rivers, and men were hired to prevent log jams by stepping on the floating logs and working their way across the rivers. As the loggers stepped on, the logs rolled, and it wasn’t long before challenges and competitions were formed. Today’s log rollers aren’t the burly, bearded Paul Bunyan-type lumberjacks you’d expect. You wouldn’t be able to pick them out of a crowd. 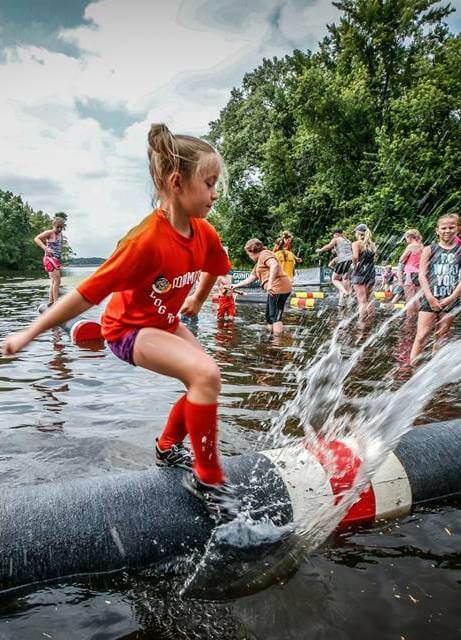 Jacob and Katie Rick, a pair of sibling log rollers from Onalaska, are spreading their passion for the sport by holding the Three Rivers Roleo Log Rolling tournament on July 9 on the Black River, near the west end of Main Street in Onalaska. 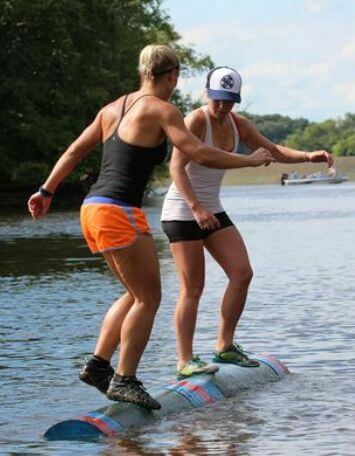 1) Logrolling is fun to watch. As you might expect, a competition created by testosteronies whose very livelihood was based on axes and danger tends to get very competitive. 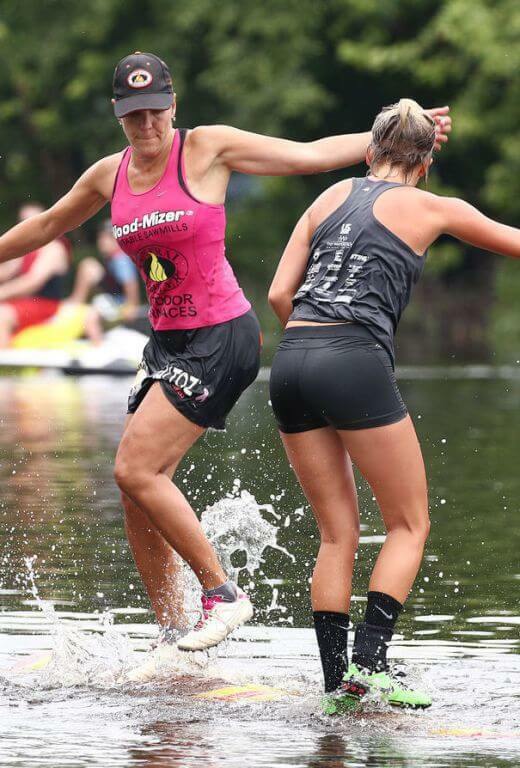 Log rollers are allowed (and often encouraged by crowd laughter) to kick water in their opponents’ faces. Of course, this can be a risky move, but it is fun to momentarily blind someone who is running on a rolling log in the middle of a river. Log rollers are also permitted to rock the log back and forth in the water in an attempt to get their opponent off balance. While it is not acceptable to kick or trip or push an opponent off a log, I’m sure someone out there has mastered the log juke. 2) It has a vocabulary all its own. 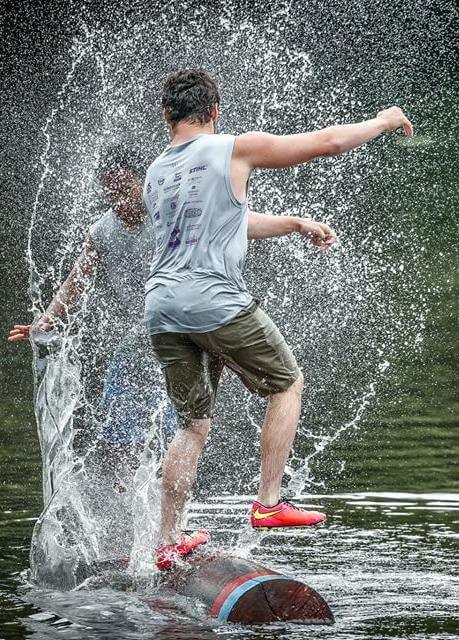 “Bobbing the log” is when a roller rocks the log back and forth — putting their opponent’s feet under water to make it more difficult for them. “Checking it down” is a phrase used by judges when they want the log rollers to slow down and get control of the log again. A “bucking match” is when two rollers face the opposite direction and fight for control of the direction the log is rolling. I think my husband and I have our own sort of “bucking match” over the television remote at night.  How many fishing and hunting shows does a man need to watch anyway? 3) You could be seen on TV. Remember that dream? The one where Aaron Rodgers throws the 50-yard pass and you catch it and run it into the end zone for the game winning touchdown? Remember the footage being played over and over on national TV? Well, wake up. It’s not going to happen. However, you might be able to still catch a glimpse of yourself on Fox Sports thanks to Katie Rick, the event co-founder who also produces the tournament’s TV footage. Last year, the tournament was broadcast on Fox Sports Wisconsin and on Fox Sports North in Minnesota, and she plans to produce footage to be broadcast on those channels again this year. Maybe it’s not the running back material you’ve been dreaming about, but isn’t it better than nothing? 4) We have several local stars. 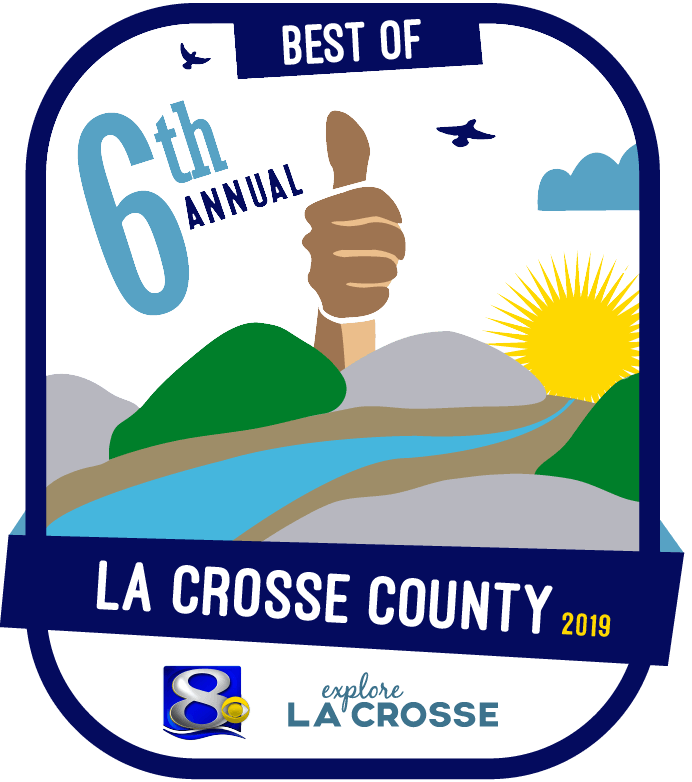 La Crosse County is home to some log rolling bigwigs. Recognize the name Hoeschler from La Crosse real estate signs? Not only is the Judy Scheer-Hoeschler a seven-time world champion, but several of her family members also hold world champion titles. Now they also make synthetic logs to promote the sport. The Three River Roleo founders, Jacob and Katie Rick, are from Onalaska, and many other professionals and amateurs call this area home. These experts also train people to coach log rolling. I know this because I once benefitted from their expertise when I took a summer logrolling classes with my oldest son. Yes, I failed miserably because I am too uncoordinated to be good at it, but I laughed enough to make up for my log rolling shortcomings. At the Three Rivers Roleo, they will show you how it’s really supposed to be done. 5) It’s all leading up to the World competition in Hayward, Wis. The newly formed US Log Rolling Open, which is now the season opener, precedes the Three River Roleo in June, along with the La Crosse Open and Midwest Championships in Madison. After that, the Namekagon River Roll Off in Hayward takes place just before the 2016 Lumberjack World Championships, which is also held in Hayward in July. At the Lumberjack World Championship, more than 100 competitors will compete for $50,000 in prize money. Who knows? By attending the Three Rivers Roleo, you could be watching this year’s world champion log roller in action. 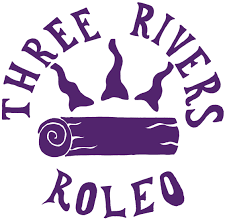 If you would like to plan your future as a log rolling coach or just learn more about the Three Rivers Roleo Log Rolling Tournament, visit its Web site at http://threeriversroleo.com or its Facebook page at Three Rivers Roleo. 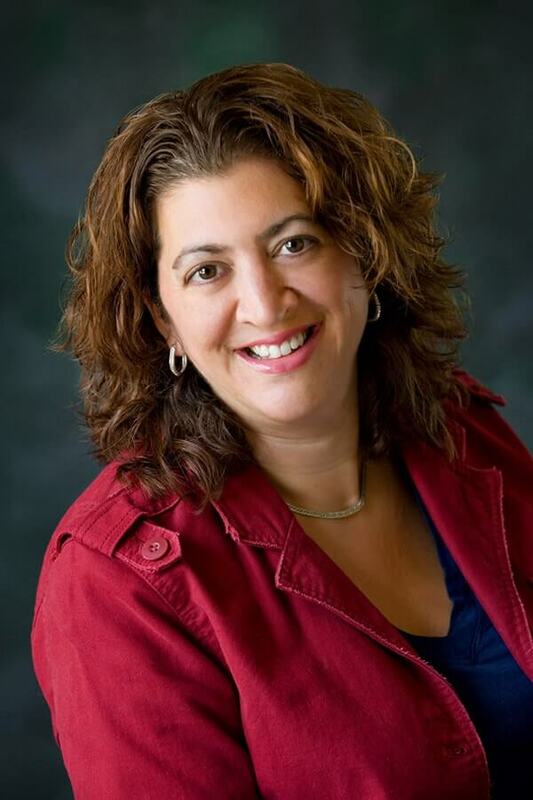 Anastasia Penchi is graduate of UW-La Crosse and a long-time Coulee Region writer who has written for area newspapers and magazines.